Designers meet with various sorts of challenges each day in their workplaces and all they need is creative ideas to make something inspiring. What would a designer want other than having innovative notions in his head? A designer sometimes gets so engrossed and exhausted in his tasks that it becomes difficult to breathe because he has to give his best all the time, expectation are already high from him and he ever wants to do something below average. He meets with a diverse range of pursuits with different mindsets of clients, all it takes is a great courage and patience to deal with all the fussy aspects because clients are sometimes very dominating and bossy, all they want is perfection. They will sometimes ask for redo, remake or entire new look of the design. In this scenario, designers have to be optimistic, determined and easy-going instead of retaliating or arguing with the client because clients’ hearts are to be won so they may come back to you over and over again presumably. Shopping is everybody’s priory hobby, not only women but even men are found doing grocery for their house. In order to carry luggage, stuff and eatables etc. One needs a hand carry for sure. Obviously you can’t hold all the stuff in your two hands. Hand carry can be of plastic and polythene, the handles should be firm enough so the stuff does not slip away or fall onto the floor in the midway. Reliable polythene bags should be used so to provide the buyers with reliability and confidence of carry it all along the way. Today I am unfolding before you free plastic poly bag mock-up PSD. 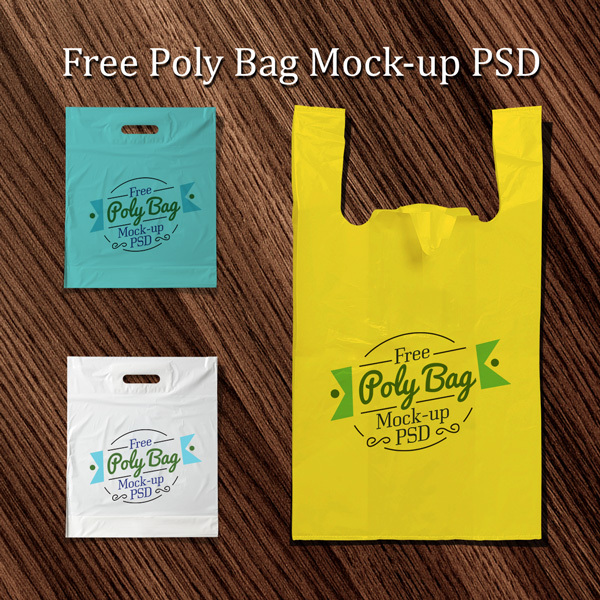 This polythene bag mockup is available here in two different sizes that you can use for your personal and commercial prospects. Just insert in your design element and there it is done. This polybag will be of light weight with a decent capacity to hold the stuff inside it safely. Stick around for more such posts, we aim to please you. Hey, it’s in RAR Format, not PSD? Samara you have to first unzip it and then get the PSD.